It is December 1944 and the Allies have landed on the beaches of France. 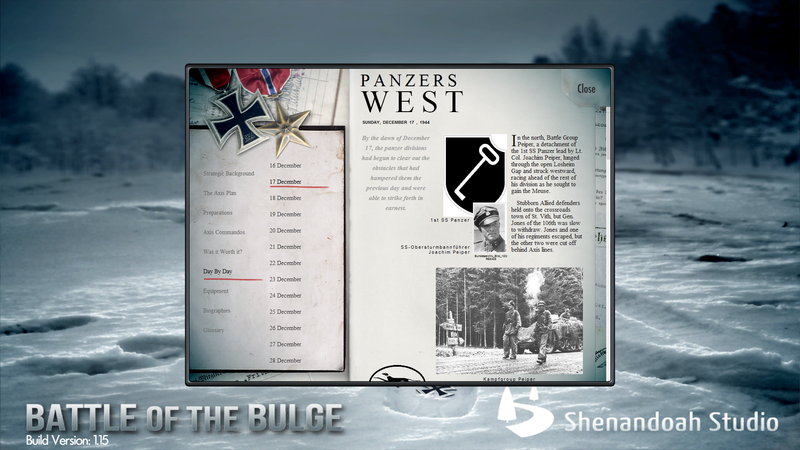 The Germans counter-attack in the Belgian Ardennes with their last massive offense of the Second World War; the Battle of the Bulge. 1 Hugh M. Cole, The Ardennes, the Battle of the Bulge (Washington, 1965) 2. 2 Charles B. MacDonald, A Time for trumpets, the untold story of the Battle of the Bulge (New York, 1985) 11. The storyline is perfect. It is like reading and playing a history book on this battle.. You will get a day by day historic overview of what happened in those days when you are playing the battle. The goals, units, commanders are all historically correct. The initial setup of the units and the reinforcements are in accordance with history.3 In the main menu there is a “History” section where you can find a lot of historically correct information and authentic pictures on the battle. 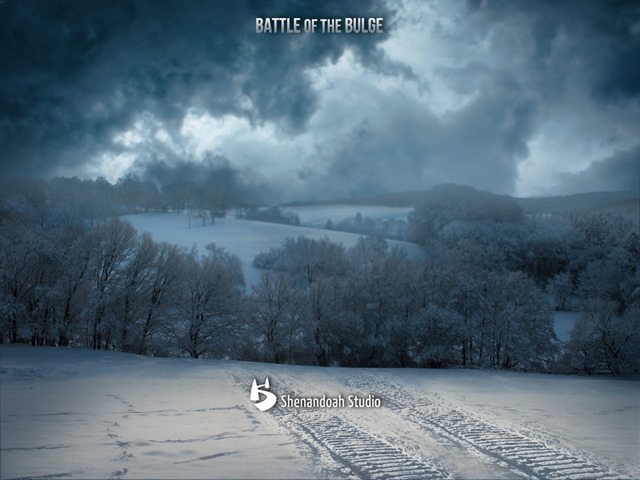 You will learn a lot of the Battle of the Bulge here but Shenandoah studio should have mentioned the sources they used for this little history lesson. 3 Anthony Beevor, Het Ardennenoffensief (Antwerp, 2015) 18,19. 4 Antony Beevor, Het Ardennenoffensief (Antwerp, 2015) 18,19. Those seem to be a bit simple in the beginning. A tank and mechanised can drive up to three area’s, infantry one. All the units have up to 7 strength/firepower/health combination points. 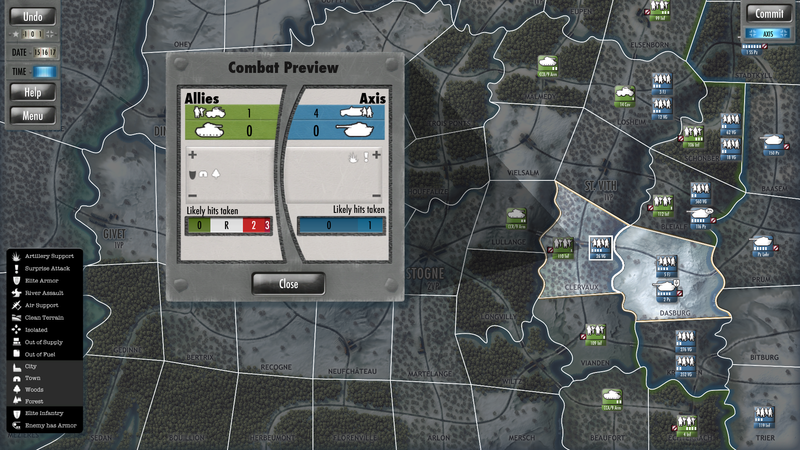 But when you check the details of the “Combat Preview” window you will see that every combat does have a lot of parameters that count and have historical resemblance to reality. 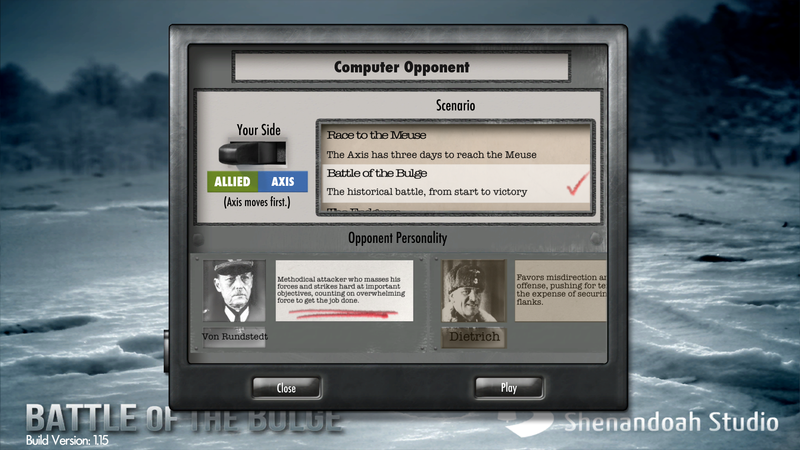 When you are starting a game against the computer you can choose your opponents personality by clicking on a leader like Patton or Bradley with their own style of command which is authentic.5 In the main menu there is a “history” section where you can check biographies of different historical commanders of the battle of the bulge. Very correct and educative. 5 Charles B. MacDonald, A Time for trumpets, the untold story of the Battle of the Bulge (New York, 1985). Rattling machineguns and the sound of rolling tanks are nice. At every days briefing you will hear old music but it is not authentic. For example I noticed when playing with the Germans I heard a Dutch (Netherlands) song and not German. Beevor, Antony, Het Ardennenoffensief (Antwerp, 2015). Cole, Hugh M., The Ardennes, the Battle of the Bulge (Washington, 1965). MacDonald, Charles B., A Time for trumpets, the untold story of the Battle of the Bulge (New York, 1985). Toland, John, Battle, the story of the Bulge (New York, 1960). More information on the games topic to enlarge your historical gaming experience! 1.”World War Two Patton and the Battle of the Bulge 1944″. 2.”Battle of the Bulge” with a lot of American veterans being interviewd.